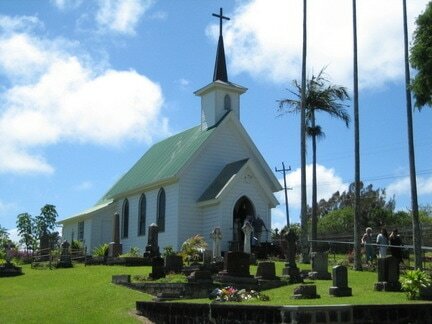 Founded as an Anglican mission in 1884 by English families who immigrated here to the sugar cane plantations, St. Augustine's Church has always been a center of life in Kohala. Today, “the red door church” reflects the lifestyle, ethnic diversity, and religious grounding of this special place. Our parishioners range in age from keiki (children) to 90+ years and have a heritage of Japanese, Chinese, Filipino, Portuguese, Puerto Rican, Korean, Hawaiian and Caucasian ancestry. The original church building, dedicated in February 1884, was a small rectangular building. In 1913 the church was expanded and the layout became a cross, adding space for the altar, sacristy and the choir. The first baptism was performed at Easter 1884 and the first marriage on Christmas Day 1885. The altar was made in England and completed its long voyage around Cape Horn by sailing ship. One side bears the inscription “This altar table is made from an oak grown on Loxley Estate, Staffordshire.” On the other side is carved “Presented to the church at Puehuehu (the Hawaiian name for this location) by the family of Sneyd Kynnersley, 1883.” The original wooden steeple, damaged by termites, was replaced by a copper steeple in 1992. Beautiful stained glass windows reflect the diversity of our congregation. The window depicting the Virgin Mary was donated in memory of Ida Von Holt. Opposite this window is the representation of St. Augustine, a memorial to Pyung Joon Lee and his son Yoon Yil Lee. Ronald Von Holt died suddenly in May 1953 and a window in his memory is next to his mother’s. It is of St. John the Baptist and “E Nana i Ke Kei Kihipaa Ke Akua” (Behold the Lamb of God) is inscribed on it. The semi-circular window in the sanctuary is in memory of Rowena Hay Wodehouse, the infant daughter of Mr. and Mrs. Hay Wodehouse. This window has the head of an angel and the inscription “Hemolele, Hemolele, Hemolele” (Holy, Holy, Holy). In 1983 a handsome window of the Good Samaritan was made in Kohala and installed as a memorial to Ruth and Kinichi Sakai, longtime Kohala residents. Windows were also given in honor of Dr. and Mrs. Richard Treadwell, Dorothy Pung and The Rev. Erasmus J.H. Van Derrlin. In 2017 the windows designed and crafted by Conrad Schmitt Studios (Milwaukie, WI) were refurbished and made operable thanks to generous donations from the families in whose memory the windows were dedicated. We are grateful to the Lee, Van Holt, and Wodehouse family trusts who made this project possible. The sanctuary is surrounded by an historical cemetery in which some of the founders of the church are buried. Near the entrance to the church are the graves of Reverend Frank Merrill and his family. On one side is the monument to Frank Paetow who was the faithful organist and lay reader for many years. Archdeacon James Walker served this church for thirty years, beginning in 1919. He is buried on the other side of the Merrills, near the church he loved and served so tirelessly. Our social hall was named in his honor. The years have brought many changes to St. Augustine. The original congregation in 1884 would look in vain for the surrounding fields of sugar cane, the muddy roads, the noisy mill, the churchyard full of horses and carriages on a Sunday, the bullock carts hauling cane. Begun during the reign of King Kalakaua, our church saw the overthrow of the Hawaiian monarchy, years of Territorial government and finally, statehood. Founded as an Anglican Mission of the Mother Church of England, she easily made the transition to become part of the Episcopal Church when the diocese of Hawai'i was established in 1969. St. Augustine Episcopal Church sits serenely on its small hill at Puehuehu, blessed with the devotion of faithful worshipers for one hundred thirty-three years and counting.